The Peavey Dark Matter DM118 offers Advanced DSP and makes the difference for all venues and Djs. Peavey has always looked out for the working musician, manufacturing tools of the trade that perform at a professional level and do so without emptying your bank account. Forty years after the introduction of the iconic SP-1 loudspeaker, Peavey has done it again with the Dark Matter enclosures. 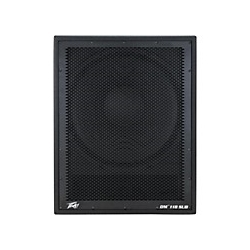 The DM118 Powered Subwoofer is an 18Â powered enclosure designed for live sound applications appropriate to bands, DJs, installations and other sound reinforcement challenges. Thanks to its new advanced DSP-equipped power section, the DM118 brings unprecedented performance and efficiency to the powered subwoofer category. These high-S.P.L. (Sound Pressure Level) enclosures feature modern styling, high output and portability to your PA system. DM 118 Subwoofer provides powerful low end with fully adjustable KOSMOS® for increased bass impact, and feature forced air-cooled power amps for optimum reliability. The ultra-reliable Dark Matter series enclosures are built tough with steel grilles and rugged injection molded cabinets. Dimensions (HxWxD): 25.75" x 19.75" x 23"
Order today and experience the difference a quality sub can make.